Royal Sands is the location of this new 1900 sq ft home. 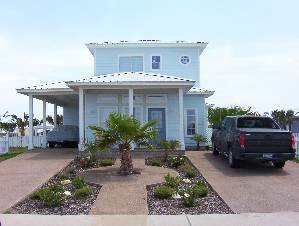 It is just few minute drive to Port Aransas, a 25 minute drive to Corpus Christi and a 10 minute walk to the beach on a boardwalk. This home is one of 10 homes built around a beautifully landscaped pool area, palm trees, lounges, night lighting, bath and shower. The home is centered on the pool and is less than 30 feet from it. This home boasts 10' ceilings, a bath and walkin closet in each bedroom. The home as been professionally decorated with attention to your comfort. 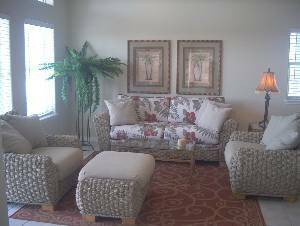 keeping with beach living--ratan, wicker, pastels and palm trees are the flavor of the day. There are 3 Dish satelite TV's w/ vcr or dvd. The dinning area has a table that seats 6 and the adjoining kitchen bar seats 4. The Kitchen is complete, such as to allow a cofortable cooking and cleaning experience. Saida Towers III condo description Please make sure you CHECK OUT the Virtual Tour by clicking on the 'Video' tab on the top left above the main picture and EXPERIENCE a Padre Perfect vacation home! 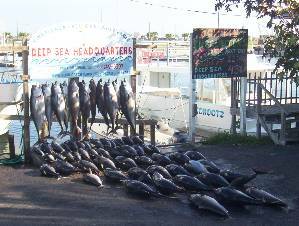 Terrific fishing, bird watching,water sports,shelling. 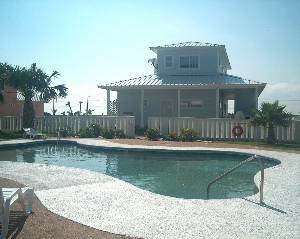 Contact the chamber of commerce in Port Aransas to help with your vacation plans. Our family stayed in this home 8 years ago and again just recently. Both times were very enjoyable. The accommodations are great. The beach access and pool access are perfect. 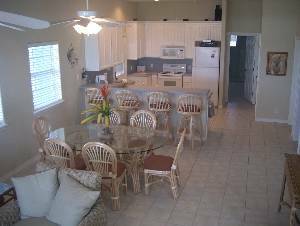 The house is very comfortable and accommodated our family of 10 perfectly. Thanks Kim for providing such an enjoyable place! This play was AMAZING!!!!!!!! I had the most wonderful stay with my sorority Gamma Phi Beta. This is a number one spot to stay!!!! Our family stayed in this home summer of 2005. It is a lovely home. The spacious first floor was perfect and very private for my husband and myself. The upper floor was private enough for the kids to enjoy. There is plenty of room for all your belongings and plenty around the house to keep you entertained while you are there. We were delighted with our stay. Thank you! We had a wonderful weekend at 115 Five Dove Circle. The house was beautiful and was the perfect size to accomodate 9 Adults and 3 small children. Everyone loved the walk to the beach, the convenience of the pool, the outdoor showers and picnic area. We were able to grill, watch a movie, play games and enjoy the time with one another. We hope to make this an annual event. There is a $400.00 reservation confirmation/damage deposit. There is an additional 13% sales tax on short term rentals. There will be an $100.00 maid fee on rentals of 5 days or less. Rates are subject to change without notice--until confirmed! Cancellations and Refunds: Full refund of deposit if cancellation is 3 weeks prior to rental dates.